The buyer came and picked up the tiny house on Saturday and the wire transfer cleared this morning. It was supposed to rain overnight before the date of transfer so I moved the house to the driveway to be sure it would have solid ground to move out from. 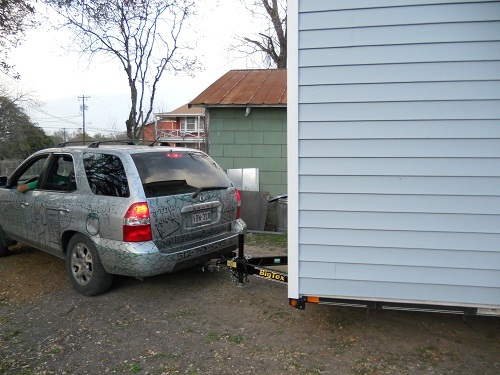 I was a little surprised to see a mid-sized SUV was able to push and pull the house to it’s next staging area. There was an issue in transporting the tiny house that I’ll post about next. It was due to a mistake I made in building. And I’m halfway through writing the designing and building a tiny house ebook. This entry was posted in Announcements and tagged tiny house sold. Bookmark the permalink. My eyes bugged out just seeing an SUV that size towing a house that size! Wow! I have a blazer that size and I wouldn’t dream of it! Maybe I’ve underestimated it. Mark, I would highly recommend using something bigger to move it much further. But to relocate it across the yard, it worked. I wasn’t sure it would before we did it. It also made the suburban that pulled it away look short by comparison.